Temperature can be measured via a diverse array of sensors. All of them infer temperature by sensing some change in a physical characteristic. The two main categories of these sensors are contact and noncontact style temperature sensors. There are three methods of contact style temperature measurement, which can generally be referred to as temperature probes: thermal resistors (RTD, thermistors), thermocouples and IC sensors. The most important specification to consider when searching for temperature probes is sensed temperature range. This is the temperature range the device is rated for sensing. The number of elements contained in the temperature probe is another important consideration. Typically the more elements in the probe the more accurate and expensive the probe is. Probes usually have one or two elements for sensing, but some can be configured to have greater than two elements. 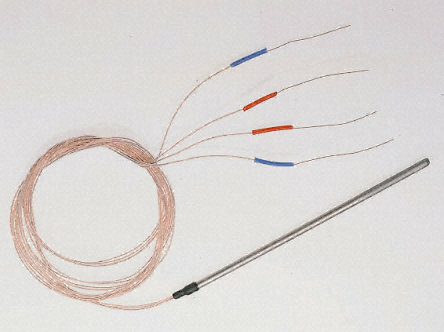 Basic sensing technologies for temperature probes include thermocouple (shown on right), RTD, thermistor, solid state, and fiber optic. A thermocouple consists of two wires, each made of a different homogeneous metal or alloy. The wires are joined at one end to form a measuring junction. This measuring junction is exposed to the fluid or medium being measured. The other end of the wires is usually terminated at a measuring instrument where they form a reference junction. When the two junctions are at different temperatures, current will flow through the circuit. The millivoltage resulting from the current flow is measured to determine the temperature of the measuring junction. They are generally simple, rugged and cover a wide temperature range. Resistance temperature detectors are types of thermal resistors - they are electrically conductive elements (typically platinum) that are designed to change electrical resistance in a predictable manner with changes in applied temperature. They are very linear and accurate, however they are typically more expensive than other temperature detection methods. Thermistors (shown below)are another type of thermal resistor (RTD is the other) - they tend to exhibit a large change in resistance proportional to a small change in temperature. Solid state or IC temperature sensors are very linear with options of high current or voltage outputs; however they typically are not usable at temperatures exceeding 200 degrees Celsius. In a fiber optic temperature sensor a thin film, typically gallium arsenide, is deposited on the end of an optical fiber. Temperature can be deduced from the reflected absorption/transmission spectrum. Other types of fiber optic sensors include luminescence fiber optic temperature sensors, where a temperature sensitive phosphor is deposited on the end of an optical fiber and when the phosphor is excited by changes in temperature the luminescence can be measured. Infrared fiber optic temperature sensors absorb ambient infrared radiation given off by a heated surface. The incoming light is converted to an electric signal, which corresponds to a particular temperature. Temperature probes can have one of many different configurations. These include straight probe, penetration or needle probe, flexible probe, drop probe, curved probe, roller or moving probe, air probe, angled probe, surface probe, clamp or strap sensor, and flat or ribbon. Additional specifications to consider include diameter or width, bare or insulated lead wires, plug or quick connects, metal braided leads, and integral connection heads.